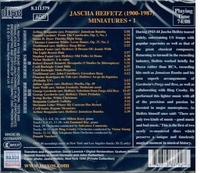 "During 1943–44 Jascha Heifetz toured widely, entertaining US troops with popular repertoire as well as that of the great classical composers. Returning to turmoil in the recording industry, Heifetz worked briefly for Decca rather than RCA, recording hits such as 'Jamaican Rumba' and his own superb arrangements of Gershwin’s PORGY AND BESS, as well as collaborating with Bing Crosby. He performed this lighter music with all of the precision and passion he invested in major masterpieces. As Heifetz himself once said: ‘There are only two kinds of music—good music and bad music'. This is the first of two newly re-mastered discs which preserve a unique and timelessly magical moment in musical history." – Christopher M. Wright (referencing Thomson‘s notorious 1940 ‘Silk Underwear Music’ review).